With the large amount of football injuries occurring during the start of this 2015 NFL season, there is a little ray of hope for the fans of four teams that have had their quarterbacks taken out due to injuries. There are some backups that are able to take and use the offense to their advantage, seeing as how they practice with them daily. 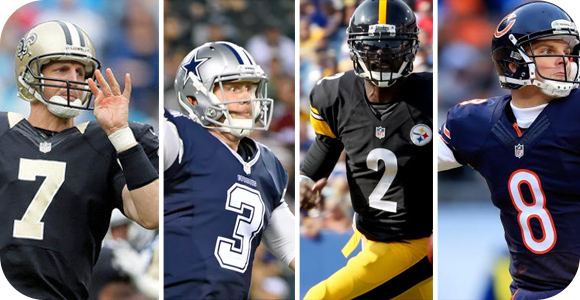 So, even if the star quarterback is injured, teams may not have to be as worried as most would think, seeing as how their replacements may be able to get the job done. The Saints had some bad luck so far this season, and it wasn’t easy when they lost Drew Brees to a shoulder injury during their game against the Tampa Bay Buccaneers, but Brees seems to be confident he will be returning by Week 4 to play against the Cowboys; although if it does happen, he may not be in the game for very long. It will be up to Coach Sean Payton to decide whether Brees should rest his shoulder another week. In the meantime, backup quarterback Luke McCown proved to be somewhat reliable during the game against the Panthers. He was not able to throw for a touchdown, and did get an interception, but he did manage to complete 31 out of 38 passes for 310 yards. These are pretty good stats considering it’s the first game he has started in after two years of being with the Saints. If Brees isn’t healthy enough to throw on Sunday, McCown could show us more. With Tony Romo getting sidelined early in the season during Week 2, it was up to Brandon Weeden to relieve him. Things were looking good for the backup, as he broke the franchise record with 21 consecutive completions, but in the end he was unable to get a touchdown pass. Ultimately, Weeden completed 22 out of 26 passes, so the Cowboys may not be in so much trouble as many thought. Off to a slow start with their first game loss against the Patriots, the Steelers came back and started dominating with their aggressive strategies, and they were working, but sadly Ben Roethlisberger was also injured during Week 3 game against the St. Louis Rams. He sustained a knee injury that looked to be season-ending, but thankfully medical exams ruled out anything severe. However, it is now up to recently acquired Michael Vick to lead the offense in their upcoming game against long-time rivals Baltimore Ravens. Many are skeptical at what Vick can do, as his playing style is very different than Roethlisberger’s is. This means it is up to offensive coordinator Todd Haley’s job to adapt the offense to their backup quarterback in time for the Week 4 game. If those three backup quarterbacks offer some hope to their teams and fans, the Chicago Bears are offering despair with their backup, Jimmy Clausen. With Jay Cutler out of the picture, Clausen had to take the reins of an already losing team, but was unable to perform well. He got shut down against the Seahawks, where he only completed 9 passes for 63 yards, losing the game 26-0. He did not show anyone that he could take the lead properly, so condolences go out to the Bears, but we still hope Clausen can pull a magic throwing arm from his helmet. It won’t be the same NFL season without competitive teams.